We're proud to announce that our inflatable pavilion for Lille Museum of Modern Art has been awarded an RIBA East Midlands 2011 award. The annual Awards celebrate 'excellence in architecture and encouraging sustainable design' and were held at the Athena in Leicester on 22nd September. Tom and Alina accepted the award from Ruth Reid, ex-president of the RIBA and were joined at the ceremony by Nick Crosbie of Inflate, who did the specialist design, fabrication and erection of the pavilion. As we get many enquiries about the inflatable event space we recently designed for the Lille Metropole Museum of Modern Art (LaM), here's a little technical summary. 15 centrifugal fans (12 active plus 3 backups), 1.5 kW power each, equipped with noise silencers. 2hD were commissioned by the Lille Métropole Museum of Modern Art (LaM) to conceive an innovative pavilion to host the ceremonies, celebrating the museum’s re-opening after five years of refurbishment and extension works. Our collaboration with LaM started in March 2010, when the museum invited us to submit ideas for an event structure to host up to 350 people for large scale events, ranging from official receptions to dance performances. 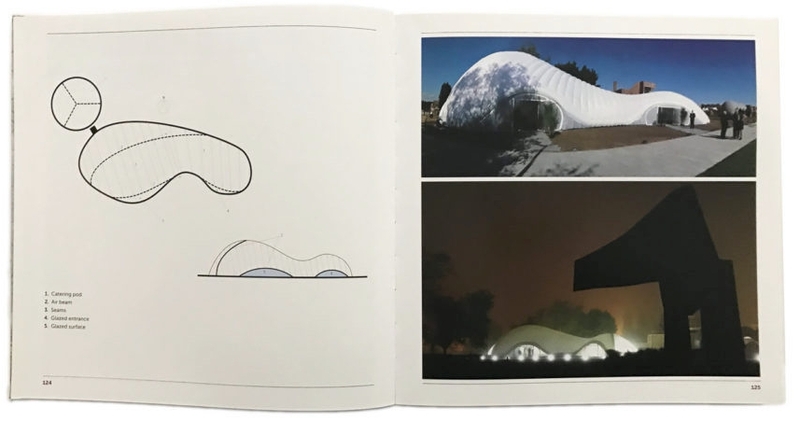 Excited by our proposal of a large scale inflatable structure but unsure about its feasibility, the museum initially commissioned us to produce a comprehensive study covering all relevant aspects of feasibility, including the erection process, structural modularity, internal micro-climate, functional analysis, budget simulations and health & safety. We then teamed up with Inflate, experienced makers of successful inflatable event structures, to produce a custom-designed pavilion that was versatile enough to host the wide spectrum of events envisaged by the museum and that fitted within the tight budget of this not-for-profit art organisation. Complementing the orthogonal lines and hard materials of the existing buildings and the urban park surrounding them, the lightweight translucent envelope and organic lines define a transient space between the park’s outdoors and the museum itself, welcoming and orienting visitors in their exploration of the extensive art collections. The pavilion also acknowledges and creates a playful dialogue with the many large-scale modern sculptures inhabiting the museum grounds. The pavilion is designed to adapt to a wide range of future uses, from public reception to theatre performance. The structure was first installed in September 2010 to host thousands of visitors for the week long opening festivities. Beyond this, the pavilion will also provide a flexible and iconic new space to host the wide variety of future events to be held on the museum grounds, ranging from theatre performance to public lectures and outdoor interactive video installations. Press releases and high-resolution images suitable for publications are also available in our press section. This pavilion received an architecture award from the Royal Institute of British Architects (RIBA) East Midlands in the Out of Region category, in September 2011. This project has also been shortlisted for the World Architecture Festival Award 2011. At night, the integrated lighting system transformed the structure into a beacon, softly glowing in the park. After being deployed and anchored, our LaM Pavilion was inflated today, in 10 minutes!